This is my account of the many ups (and some downs) of my culinary journey from novice to Domestic Goddess! Stick around and see what happens! The current weather is leaving much to be desired except for snuggling up on the couch, under the covers with a book/movie and a cup of tea. It's starting to get ridiculously cold and snow is starting to fall too which I'm not very happy about at all. While trying to not look outside, I thought this would be a perfect time to share photos from an adventure I took in September with my friend Jen. I will also indulge in the occasional glass of wine but I've never been very big into it. However, when over at a friend's having dinner and discovered wine from a small winery in Beamsville, Ontario, called Organized Crime. Naturally, I had to go and find some more of their 2011 Riesling because it was heavenly. Thus, on a spontaneous Saturday afternoon, Jen and I loaded into the car and headed off to Beamsville. The joy for me is that the winery is about a 40 minute drive from my place which makes it much too convenient for me to visit on a whim. The weather was beautiful and the scenery was breathtaking!! You guys know how much I LOVE things in neat rows!!! Green grapes for white wine!!!! My favourite! The view from Organized Crime's seating area! What a gorgeous day! View from Angel's Gate Winery. Such a pretty gate... one may even say an angelic gate? If you've ever have the opportunity to visit these wineries, I can't tell you how much I'd recommend it. The street where Organized Crime and Angel's Gate are located has a whole bunch of wineries on it which makes it so easy to find quite the collection of wines all in the same area. Also, if you're lucky enough to have amazing weather like we did, make sure you stop somewhere to eat and bask in the glorious weather!!!! I hope you're all keeping warm and cozy on these cold nights. I've got so many more adventures to tell you all about and can't wait to share them with all of you! Roast Chicken for 4... or 2... or 1! A few weeks back (oh boy, it's actually been 2 months!!!) I was home alone for a whole week and let me tell you it was heavenly! I became a bit of a Suzie Homemaker and spent my time baking, cooking, sewing, knitting and all in all just having a pretty amazing time doing whatever my little heart desired. On one of those lovely nights, I made the most delicious roast chicken dinner for me, myself and I. This meal could definitely feed multiple people or a smaller number of people for multiple meals. A roast chicken is truly one of the easiest yet most satisfying things to make. It's so versatile because you can customize it to exactly how you like your chicken to taste. Like things more spicy, DONE! Want some herb flavoured chicken, DONE! Not sure what to do with the spices in your cupboard, slap them on a chicken and roast it! It is one of those things where you can't really go wrong with the seasoning. I know that most times it's very very easy to simply pick up a pre-made roast chicken for dinner but in just over an hour's time (depending on the size of your chicken), you can have a gorgeous little roasted bird waiting for you without all of the other 'funny bits' that are sometimes included in store-bought roast chickens. Also, if buying a bulk package of roast chickens (Costco sells 3 packs), you are definitely saving in the long run. Throw the extras in the freezer and you've got a whole bunch of meals ahead of you. You could even pre-season your chickens before freezing which would make them THAT much easier. Years ago, my Mum attended a Pampered Chef party and came home with a bundt pan with a covered centre (aka no hole in the middle). On the particular night that I was roasting my little chicken, I decided that I would use whatever spices we had in the cupboard but I also wanted to try a new veggie with it. So I picked up a lovely little acorn squash and added it to my sweet potatoes for some variety. Acorn squash is quite lovely, I will admit and will definitely make more frequent appearances in my kitchen in the coming months. This is the point where I had cut up all my veggies and put them in the bundt pan before I realized that I forgot to spice them up... UGH! Into the bowl they go for a little spice bath! This was the cute little chicken that I found at the grocery store. My spice blend of choice for that night... But I truly say do what feels good! All dressed up and ready to party!!! Add the veggies around your chicken before baking. Everything will cook and mix and be amazing! Once all veggies are removed from the bundt pan, take the liquid in the bottom and heat it quickly in a sauce pan. It will make a glorious sauce that just makes life make sense again. Serve with broccoli and whatever else rocks your boat! Enjoy the sauce too!!!! I promise as much as this seems both like a labour intensive dish but it isn't and it is worth every second of it. Try this! Try this! Try this! I'm sorry for my distance lately.... As always the insanity of every day life has caught up with me but I'm trying to get a bunch of posts ready for the next few weeks!!! Plus, Christmas baking is already being planned and I can't wait to share it with you all! 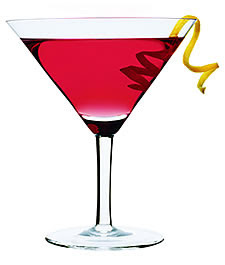 Hope you're having wonderful Saturday nights! Chocolate Cupcakes on a lazy Sunday evening! A few weeks back, on a rare occasion, all of the grown children of my household were home (barring 1 girlfriend - T-bear, you were missed terribly!!). This sort of thing never happens as we're all in our 20s and usually all over the place. My brother is typically at school somewhere in the US, my step-sister in past years has been at school in Kingston, and I'm just all over the place. Needless to say this was a big deal! While we were prepping dinner and catching up on what was going on with everyone, my step-sister mentioned that she had a craving for a simple chocolate cake with plain chocolate frosting. Apparently this is hard to come by which I find to be insanity! How can no one make just simple chocolate cake with chocolate frosting any more? Have we really become so entertained by all of the crazy cake flavours out there that we've forgotten that sometimes the simplest things are the best? Before I go off on a huge tangent about simplicity in the kitchen, I digress! So to help the poor girl out in her quest for chocolate cake, I decided to whip up a batch of Martha Stewart's One Bowl Chocolate Cupcakes. I was fascinated by the claim of these actually only using one bowl and truth be told, it worked... Well... one bowl and one sifter but still! This batter takes all of 5 minutes to mix and produces results comparable to cake mix without all the added grossness that goes into mixes. The ingredients were all found in my kitchen and I think it's safe to say that they would be found in most other kitchens too. I cannot stress this enough... GO MAKE THESE CUPCAKES! You will not regret it one single bit! These little beauties have the most gorgeous shiny tops ever. They are good enough to eat sans frosting even! The cupcake liners don't hurt either! You can never go wrong with polka dots! Once we had the cupcakes made, it was time to frost these babies up with a simple chocolate frosting. My frosting was made with butter, icing sugar, a few tablespoons of cocoa powder, some vanilla bean paste (or you could use vanilla extract) and a touch of milk. I know that usually I am religious at piping my frosting but sometimes you have to live a little and just do what feels right. These were not cupcakes for an order, they were cupcakes for a family dinner in the backyard while playing (slightly intoxicated) ring toss on a 6 foot tall Eiffel tower. All I can say is YUMMMMMM! Now, I think the best part about these is that they were enjoyed by all. 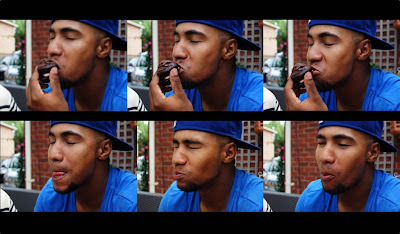 Exhibit 1 is a montage of my brother, Brandon, devouring his cupcake!!! 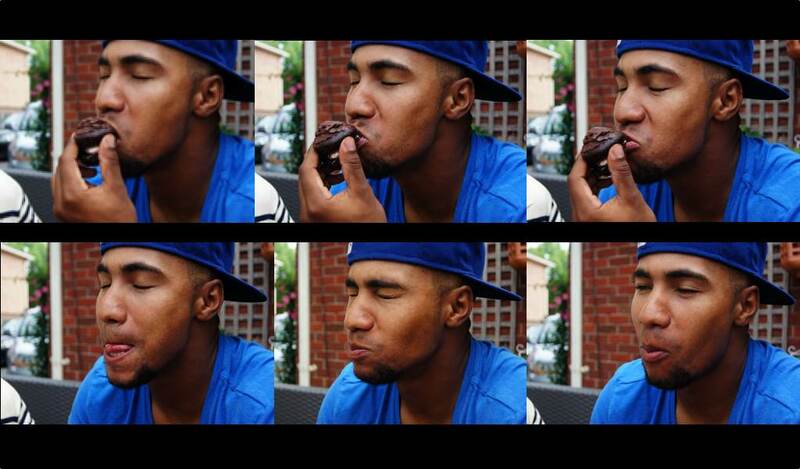 I can't help but laughing at his facial expressions! We had some strawberry buttercream frosting left from this post and we managed to make little cupcake sandwiches that were devoured as well! Even our cat, Mo, had some! So next time your family is over and someone is craving some simple chocolatey deliciousness, promise, promise, promise me that you will give these a try! Pinky promise!!!! I hope you are all enjoying a wonderful weekend now that the rain has finally stopped! Happy weekend-ing and happy baking! Novice Goddess' Kitchen Diary by Tamara Dhue is licensed under a Creative Commons Attribution-NonCommercial-NoDerivs 3.0 Unported License. Permissions beyond the scope of this license may be available at novicegoddess@hotmail.com. If you would like to use any of these images or excerpts of text from my blog, please contact me first at novicegoddess (at) hotmail (dot) com. 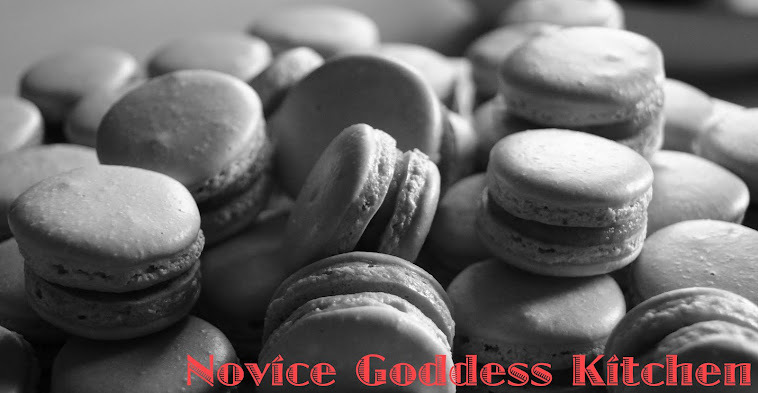 All works, recipes & photographs, unless otherwise noted, are sole property of the Novice Goddess. Ethereal theme. Theme images by blue_baron. Powered by Blogger.